Kimolos is about 1km away from Milos island from Apollonia port. It is a quiet and peaceful island with few inhabitants (less than 600). It has many beaches that due to the small amount of tourists that visit the place, compared to other Greek islands, are still "virgin". 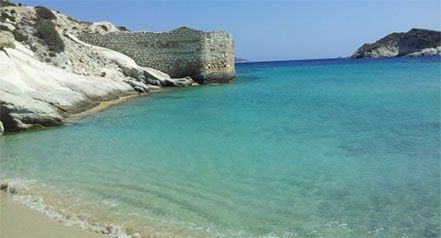 Visiting the place is easy as there are daily itineraries to Kimolos from Milos. 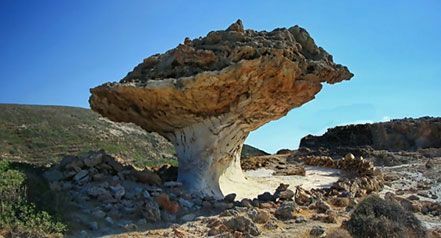 Kimolos also has a unique mineral composition due to its volcanic nature and strange geological formations. Large areas of Kimolos are covered by tuffs and the volcanic activity can be obvious from the hot springs, existence of a notable geothermal field. There are organized beaches and non organized ones, and some that are nudist friendly. If you decide to spent your vacation there we can always deliver you a car rental at the port of Kimolos on the day and time of your arrival. Skiadi is a rare geological formation caused by ablation where the wind carries the dust and continuously scratches the rock, shaping the soft layers at the bottom much easier and faster than the ones on the top that are much harder. This process is what caused the Skiadi rock to form a mushroom like shape that attracts so many people from all around the world. Agios Georgios is located in the north eastern side of Kimolos and it is one of the most famous ones because of its clean water and sandy beach. This is why it is considered to be one of the best beaches of the island. There are some sea caves under the church of St. George (Agios Georgios), where the monk seals breed in the autumn. Around the islet Prassonissi, the sea bottom is shelter to many kinds of fishes, sea urchins and corals.